A far wiser man than I once said “You can never have too much of a good thing”, and I’m beginning to think the author of this cliché was, in fact, a prophet overcome by images from the future – a vision of Spider-Gwen. This Spider-Woman from an alternate Earth, who in her reality didn’t die at the hands of Green Goblin and instead was bitten by the radioactive spider that granted Peter Parker his powers in the established Marvel Universe. 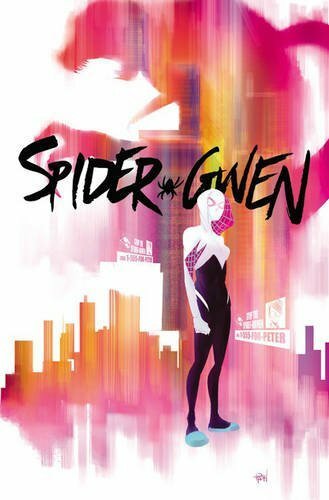 Gwen Stacy, is a part-time rock star in the making and, much to her chagrin, destined to become a full time super-hero. So whilst Gwen became Spider-Woman, Peter Parker (obsessed with the arse-kicking arachnid) became, in an insane bid to emulate his hero, the Lizard. Unfortunately for both alternate Pete and Spider-Gwen, the Lizard fell in battle, the former dying, accidently, at the hands of the latter. This becomes the cross that Gwen’s forced to bear, as the knowledge that she was “responsible” for the death of her best friend is the primary motivating force that drives Ms. Stacy to become the best Spidey that she possibly can. Which, as Greater Power begins, is exactly what she’s attempting to do.